It appears that the actors name is Takis Kavouras. Regular blog reader Scott sent me some info on an actor who looks exactly like the one in the photos below but older from a film made in the 1970s. Now what's interesting is that a certain Taki Karas was credited for THE GIANTS OF THESSALY, his biggest PEPLUM role. Initially I thought that the actor's name was Taki Karas but someone else, who shall remain nameless, told me that Taki Karas was a female. Well, it's now guaranteed that the Taki Karas credited for THESSALY is actually Takis Kavouras but with a slight variation of his name. Mystery solved. 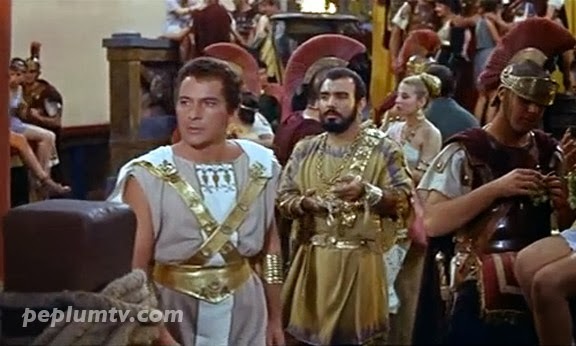 The on-going search for the identity of a mysteriously nameless actor continues: spotted him in SIEGE OF SYRACUSE as a merchant trying to sell jewelry to Rossano Brazzi. 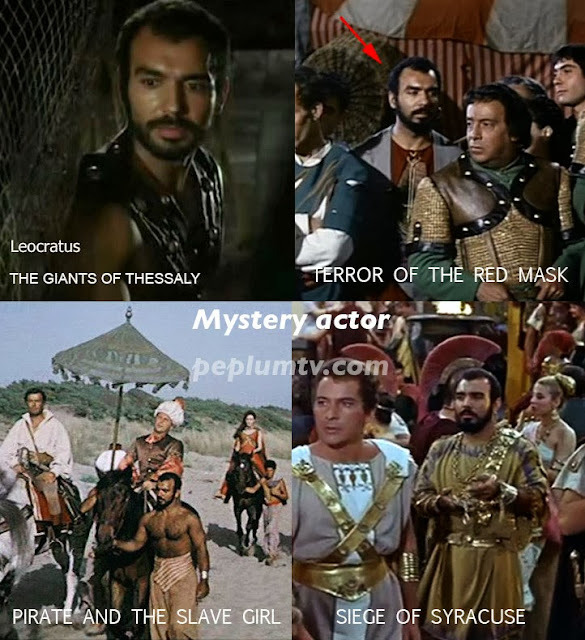 This is the 4th spotting, with major roles in big productions like THE GIANTS OF THESSALY and this one. It's a brief role but still no identity after 4 films. Here's last month's article: link.